The 31st High-Level Talents Conference of Jiangsu got underway in Nanjing, the provincial capital, on Sept 9. 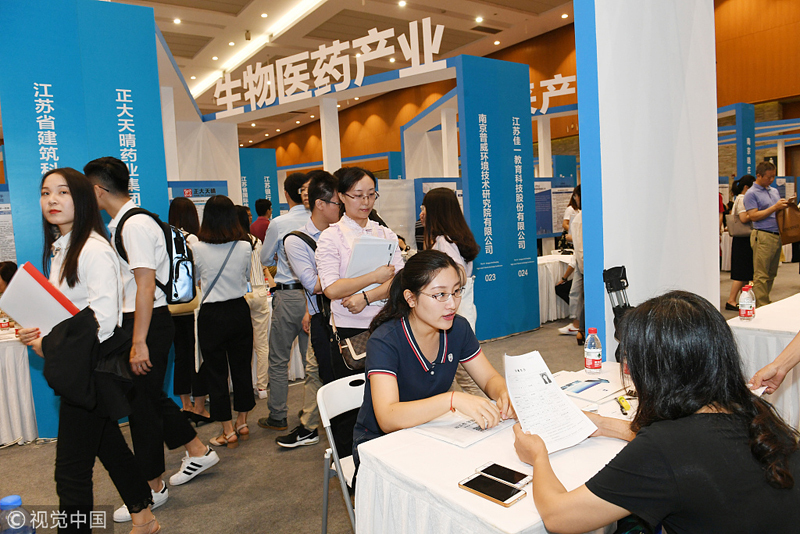 225 state-run enterprises, academic institutions, and high-tech companies attended the conference, extending their thirst for managerial and technological professionals. China Key System and Integrated Circuit Co offered 600 available seats on chip and integrated circuit design, and attracted over 100 candidates in the morning itself. Recruiting manager Gu Minjie said the company's fame has helped it gain popularity, but the number of applicants that lived up to their expectations were only a few, let alone those with experience in the industry for over 10 years. Some 30 local higher learning institutions delivered munificent "olive branches" to high-end professionals that were included in a variety of national talent support and cultivation plans. Jinling Institute of Technology offered an up to three million yuan of support to these professionals, helping them smoothly settle in the city. They may also get an at most two million yuan financial aid to initiate their research work at the campus.